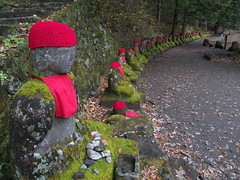 I took a lot of pictures in Nikko (I took a day trip in the middle of the stretch I stayed in Tokyo). This is the single biggest batch; it probably took a couple hours to upload (what with the huge pictures and all). I'll be posting more pictures from Kyoto, but I'll be breaking that up into two batches. The pictures from Nikko proper aren't really that great. There's some neat stuff there, but it's really a bit too gaudy. On the other hand, the national park bits are really pretty nice, and I wouldn't mind coming back and spending time in the hot springs. Wow, that temple was great. I saw a lot of temples in China this time and none of them held a candle to that one (and, as they are buddhist and out of the same tradition they look fairly similar). I loved the waterfall pics, especially that opening one out of what looked like a drainage ditch. Thanks for the pic of the basalt columns, I had been wondering what it looked like up close, and then, bam!, there it was. Only a few batches left, probably do one tomorrow, and the rest this weekend.